On January 17 I took part in the Reading Agency/Publishers Association conference at the rather lovely Canada Water Library in Southwark, where we discussed ways for libraries to embrace new technologies in order to take their support for readers online. 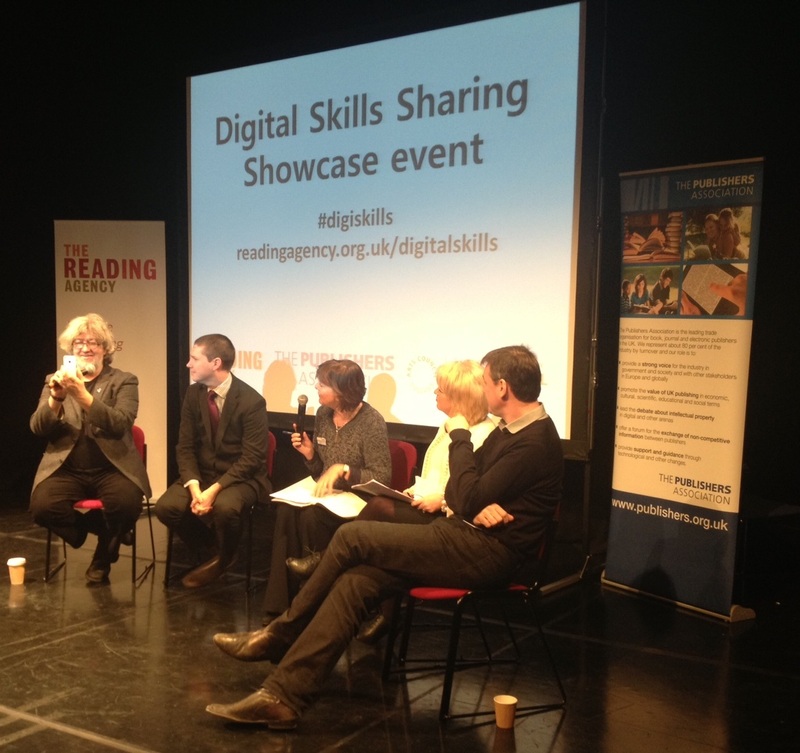 It was the final event of a project around digital skills sharing, and you can find more details at the Reading Agency website. I took part in a panel session, which was lots of fun. I also gave the keynote talk at the start of the afternoon, which you can read here. We live in a society that is as dependent on access to and engagement with computers, digital data and fast networks as the one I grew up in was on electricity and the one before it on oil – although of course we still depend on both of them, and seem have added computers to the mix rather than replaced what went before. In this, the age of electronics, the patterns of my daily life are increasingly defined by the capabilities of the digital tools I engage with and I find myself reliant on internet access and my smartphone as I negotiate home, work, family, friends and my engagement with culture at all levels. Most of my media consumption relies on IP – the Internet Protocol – instead of broadcasting, to the point that when our Freeview TV stopped working we didn’t get it fixed for weeks and I hardly noticed, yet if Twitter is over-capacity I get withdrawal symptons within minutes. Yesterday I heard about the awful helicopter crash in Vauxhall from Twitter, not from any journalist. I saw photographs taken by people standing nearby, and from buildings overlooking the crash site. I was alone in this. I realise that my experience is far from the norm, but as an inveterate early adopter and experimenter I think I make a useful subject for study for anyone trying to figure out the environment within which libraries will operate and, even more importantly, the space that reading will come to occupy. After all, libraries and publishers serve readers, not the other way around. 4G rollout will start to change assumptions about mobile connectivity. EE really is only the start. Google Project Glass will get into people’s hands (or on their heads) and HD streamed video with (some) overlayed data and audio will start to happen. Augmented reality (though it’s an absurd term) will become commonplace and the idea become uncontroversial. Tablets will be everywhere., though the original iPad will become a coffee-tablet, used for high end apps like Orchestra, the Sonnets and The Waste Land. My Nexus 7 or iPad Mini or Galaxy Tab will be the one I carry around. In this rapidly shifting landscape we are seeing new media forms emerge from the old, grafting digital characteristics like immediate feedback and direct engagement onto analogue entertainment genres, bring news in an instant and offering direct access to newsmakers without the filter of the reporter or editor, and reshaping our assumptions about what happens in the classroom and what education is for. But what is happening is not ‘convergence’, if that is understood as the coming together of all different forms of creative expression into a bucket of bits labelled ‘content’ that can be delivered over the network to any screen or any device. Instead we’re seeing new forms of media life evolve, each specialised to survive in a particular niche, all competing for attention in a world that can seem saturated with stuff demanding to be watched, listened to, discussed or reviewed. Only some of these new forms will flourish, and we’re in the middle of a period of discovery and experimentation as exciting as the early years of Gutenberg’s experiments with printing or – to my mind – the evolution of the written alphabet. Unfortunately we can’t tell in advance which innovations are going to succeed or what this will mean for the established forms of engagement, which poses a major challenge for anyone engaged in building tomorrow’s libraries. What use is a new media strategy when everything you think of as ‘new media’ could be superseded? Perhaps we need to step back a little, and ask a bigger question for which any useful answer would have a longer timeframe. Perhaps we should allow ourselves to ask ‘what use is reading?’, and see whether the answer that emerges is one that requires books and publishers and libraries and librarians, because if we can do that then the exact form of the digital media landscape becomes less important than the fact that the Lake of Literacy is clearly visible, just beside by the Library Steppes, and that it teems with life. Let me begin by telling you about Nick Carr, who I like to count as a friend even though we have never met in the real world and have a relationship mediated through email, cross-posted comments on each other’s blogs and that general superposition of online state that comes from shared presence on social networks and shared interests in the impact of technology…. This Nick Carr, who I don’t really know at all, wrote a book called The Shallows in which he expounds the thesis that our wonderful internet culture of screen-based interactive multimedia filled with hyperlinks and real-time conversation and constant alerts from Twitter and Facebook and Google+ is destroying our capacity for deep reading and immersion in the linear text. Today’s middle-class children are growing up into a world dominated by networked devices, and they are being exposed to a real-time stream of Facebook updates, tweets, blog posts and YouTube comments almost from birth. Adults aren’t immune, of course. I doubt I’ve gone more than a couple of days without using a computer in the last thirty years, and have had a mobile phone with me for at least the last fifteen. I find it hard to recall what it was like in 1979 during my first term at university when the phone box on the corner of Silver Street and Trumpington Street was my connection to home. I did at least have twenty years without computers in my life. My daughter, however, is clearly in the real-time generation: I didn’t use a computer until I was nineteen, yet she built her first website when she was four. Some people might think that exposing her to screens from such an early age is bad for her development, but I was doing something equally interventionist at around the same time – I was teaching her to read. We were never born to read and reading is not an innate ability as language seems to be but something every one of us has to learn how to do. We invented reading only a few thousand years ago, and with this invention we rearranged the neural pathways in our brains, which in turn expanded the ways we were able to think, which altered the intellectual evolution of our species. Maryanne Wolf’s marvellous book Proust and the Squid: The Story and Science of the Reading Brain, offers solid evidence to show that a literate person thinks differently from an illiterate one, so we must conclude that teaching someone to read imposes radical changes in neuroanatomy and brain function. Making someone literate is really a form of brain surgery, carried out with words and pictures instead of saws and scalpels. It is a process of rewiring the brains of children to make them able to thrive and be useful in the wider society as they reach adulthood. We have decided to do it, and to impose this new way of thinking, on every child, and presumably we will continue to do, investing billions of dollars every year in creating a captive market for publishers and a large set of potential library users. Not only that, we have given librarians a special responsibility. We ask you to ensure that children develop and adults retain a ‘love of reading’, one that not only allows them access to the depths of knowledge buried in books but ensures that they come to enjoy the process. This is a unique responsibility. Nobody is asked to engender a love of maths, or driving, or cleaning. We accept that having these skills matter, whether loved or not. Reading is different, and if you have a problem now it is partly because previous generations of librarians were so good at their job that the expectations placed on you are very high. Maintaining your success in a screen-based world is therefore a serious challenge. The ability to read fluently could come about only because of the human brain’s extraordinary ability to make new connections among its existing structures, a process made possible by the brain’s ability to be shaped by experience, and the plasticity at the heart of the brain’s design forms the basis for much of who we are, and who we might become. will unguided information lead to an illusion of knowledge, and thus curtail the more difficult, time-consuming, critical thought processes that lead to knowledge itself? Will the split-second immediacy of information gained from a search engine and the sheer volume of what is available derail the slower, more deliberative processes that deepen our understanding of complex concepts, of another’s inner thought processes, and of our own consciousness? In the computer age a new form of literacy may emerge, and we may need to think differently in order to acquire that form of literacy. At the moment there does seem to be a difference between screen-based literacy and page-based literacy, but we can’t conclude that this is a real difference without examining our behaviour more closely. I don’t think that having access to Twitter diminishes my capacity for deep reading, nor make it unachievable in the young, although it does mean it has to be something taught and worked at, like other skills. It also has to be maintained. But then, it always has been – making people fully literate has never been a trivial task. That is why libraries matter and deep reading matters and a love of books matter. They are the thing from which Twitter evolved. We can speak eloquently in 140 characters because we also know how to speak over 140 or 1400 pages. The point of having ‘digital skills’ is not to replace physical spaces with online ones or physical books with electronic editions, it is to allow the two spaces to intersect to the point where there is no need to distinguish between them, to create, in libraries and other shared spaces, a sharing between real and virtual, a liminal space. The library has always offered access to the private space of the mind, and we see it as readers sit engrossed in books, sometimes dropping to the floor beside a shelf because the effort of moving to a seat would require too much detachment from the scenes inside their head conjured up by the words. Now they have to offer access to the shared space of the network. It’s more complicated, because it requires more than shelves, seats and light to read by, but no less important. We have made this space, many of us already live significant parts of our lives in it, and you can be a gateway to it. And more importantly, you can bring the books with you, to be read and loved on the page or the screen. But of course each individual library has the unique property of being the only place that is the place it is – to paraphrase Walter Benjamin’s comment about works of art in the age of mechanical reproduction. Even if a room in your library is a gateway to an infinitely replicable virtual space we must always acknowledge that the combination of physical and virtual space is itself as unique as the physical space, and allow for the local reality to intrude. This is, of course, even more so for the people, the ‘readers’ or those who are becoming readers. Each of us brings the world inside our head into contact with the world inside a book. We do that in a distinct physical space which may overlap and intersect with a virtual space. Like snowflakes, each combination has never existed before, and if you are to nurture it then you must appreciate its uniqueness as well as the commonalities we experience online. The success of the digital skills sharing project in finding ways to help libraries navigate their development into the crossing-points between real and virtual is a great sign that reading – proper reading, deep, engaged, committed reading, reading that makes the world disappear – is not going away, whatever may happen to the delivery mechanisms and whatever other forms of writing and reading may emerge to share the ecosystem. I agree with ‘The Shallows’, I’m having to relearn how to read properly again (with books!) as my default on-screen reading technique is to skim read. Glad the blog is back. I’ve fixed the link on your wikipedia page! I was privileged to be present at your presentation at Canada Water and drew much inspiration from it. I have to say that I found the actual projects a bit disappointing when compared to the ‘immersive’ experience you envisioned. Having spent much of my working life battling against council IT departments’ apparent mission to prevent libraries from exploiting any resource based outside their corporate firewalls (perhaps an understandable paranoia) I wonder if it’s time for libraries to reassert themselves (as they did in the 1970s) as an agency of sufficient responsibility to once again be allowed the freedom to roam the great wide open spaces of the internet? I also wonder if the existing use of bookstock (and the transition to digital) might be more effectively achieved by transforming it into a connection to the wider world by uniting the power of RFID (already installed in many collections to facilitate self-service) and NFC (now appearing in a smartphone near you – and compatible with library RFID) to turn the pastime of browsing the shelves into a global voyage of discovery? Experiments in Oslo public and other libraries are already rethinking how books might themselves be used as ‘finding tools’. Both would of course require a rather more visionary approach to service provision than is generally encountered in a local IT department or likely to be endorsed by a central government dedicated to pushing everything (including access to global resources) down to the localities. Previous PostPrevious My pledge: I will not speak on/moderate all-male panels at conferences.